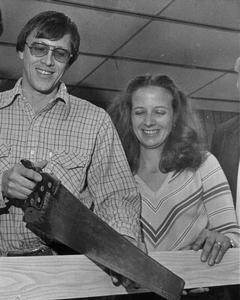 The Hardwood Connection was founded in 1979 by Ken and Barb Burtch. Our goal is to provide the finest hardwood lumber and woodworking machinery available at competitive prices. In the beginning we designed and built custom furniture and provided antique restoration. We learned a lot about which construction technique worked or failed prematurely. We will share our skills with you to ensure your projects are a success. We outgrew our first location after 2 years and moved into a 4000 square foot building in downtown DeKalb. We operated at that location for the next 16 years. In 1997 we moved to our current location. This 10,000 square foot, custom designed facility allows us to inventory over 40 species of native and imported hardwood lumber in our heated warehouse, display over 40 models of machinery in our showroom, and offer premium millwork services in our mill shop. We continually promote woodworking by sponsoring seminars, demonstrations, and offering personal assistance to a multitude of craftsmen on a daily basis. In "The Birchwood Gallery" we promote the craft by displaying some of the best hand made woodcraft available. Visit us when you are looking for a handcrafted gift for yourself or a special occasion. We are located on Illinois Route 64, one mile west of Sycamore, on 7 scenic acres bordered by the Kishwaukee River.